Savory Bistro is this restaurant serving western fare ranging from homemade pancakes, pasta, specialty steaks, tapas, vegetarian-friendly fare and a selection of wines. 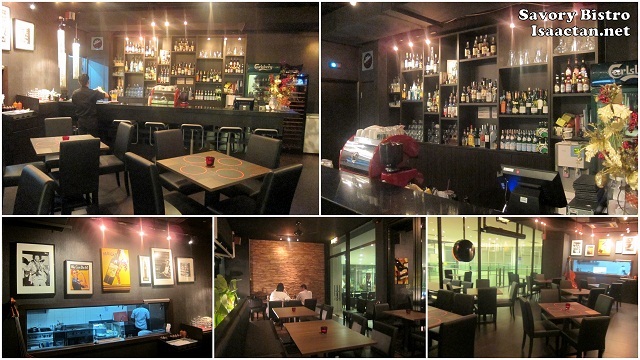 Located over in Mont Kiara area, the bar-like restaurant was rather hidden, tucked away on the first floor of a condominium block at the end of Jalan Kiara 1. I had the opportunity to sample some of their dishes the other day along with friends, and it wasn't bad at all. Aptly named Savory Bistro, we were served with some rather savory dishes which did tingle our senses. Arriving just in time for dinner, my stomach was ready for all the good food. Even though the location for this restaurant was a bit secluded, I felt it was a hidden gem of sorts, something you find hidden away but really good. Do check out what we had that evening. We kicked off the meal with some wholesome Cream of Pumpkin Soup, which at RM13 was enough to whet the appetite of at least 2 diners. It comes with scallops and goes really well with the garlic croutons. The next dish that arrived was a seafood dish, the Spaghetti Marinara consisting of prawns, seafood and chili. I'm more of a meat person, but Janice who had this dish did mention it was good, especially the sauce. I guess a good Marinara has to have a good sauce to douse the ingredients in. Next up was a meaty dish, one which I appreciate especially when it comes in the form of a 200gm beef patty and cheddar cheese. Served with huge chunks of steak fries, I would say Savory's Cheese Burger can fill up at least 3 stomachs. It was huge, with juicy beef patty to satiate my carnivorous appetite. Of course, my favourite would be the next dish that arrived. Personally, I think I have been having a tad too many steaks in recent weeks, but my stomach will never say no to some good tender rib eyes, or tenderloins cut. The meat for this Fillet Mignon Steak (Tenderloin) was medium done, with every bite I could feel the juices which was a pretty good feeling. Served with Savory Bistro's brown sauce, mashed potatos and assorted vegetables, I truly enjoyed this dish, which at RM50 was rather appropriately priced. Overall the food at Savory Bistro was good, a hidden gem amidst all the other restaurants and cafes in the vicinity of Mont Kiara. With Publika - Solaris Dutamas a stone throws away, do drop by Savory Bistro should you happen to be around Mont Kiara. Hehe, steak has always been my favourite.. nom nom ! I will surely order Well Done.. gosh, these western food are really expensive, hor.. but as long as they taste good, it is worth it.. not like the one I went the previous week or so.. terrible taste! Never want to go there again..
i would prefer well done..
Savory Cheese Burger so dark @@!